The 2012 logo, designed by Wolff Olins, used our Klute typeface as its starting point. Its spiky angularity and mix of medieval blackletter and street tagging forms were presumably a useful reference for the buzzy animating mass of diagonals identity Wolff Olins were aiming for. 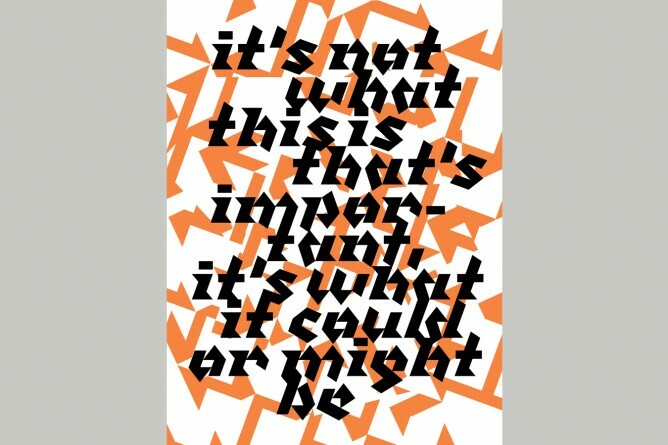 The poster above advertising Klute’s release in 1997 has orange Dazzle Ship camouflage markings, more basic than 2012′s multicolour shards but the effect is similar. Used in the examples above is Klute Black, the typeface’s more pointily graphic version. As a corporate font it might not function too well, but it has the kind of unique, defined spirit that a corporate font needs. 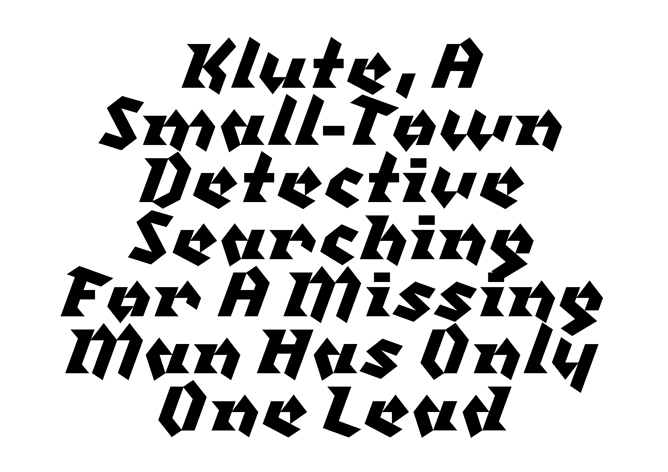 A light, readable type in the spirit of Klute would be a good brief for the 2012 typeface. Klute, however, is not universally popular, being called ‘ugly and useless’ by one commentator. In attempting a graphic identity that matched the London Organising Committee’s proposal to the IOC of focussing on youth, and with its associated reference points, Wolff Olins were always treading a fine line. They were opening themselves up to criticism of pastiching youth graphics and neglecting ‘London’ symbolism, geographic or national iconography being a standby for Olympic logos. 2012 was not an identity that would sit comfortably in middle England. Britain has a well deserved reputation for its creative industries and an equally deserved reputation for its fondness for nostalgia. There was a huge reaction, media fuelled and internet and social media driven. 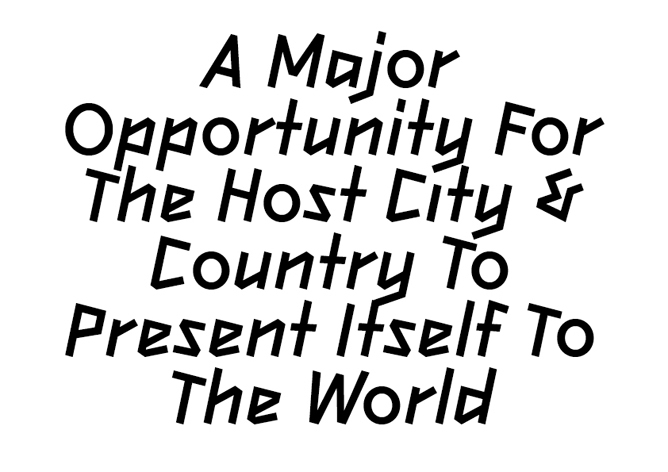 There is a debate to be had over the qualities of the identity, typeface included, which was lost in this hyperbole. The typeface was designed to work within and support the pre-defined system of angles and shapes, to capture a spirit of simplicity, modernity and angular geometry. As the logo was a mix of angles, so it made sense for the type to be also, using examples of handwritten lettering and modular, linear and conceptual typography as references. The idea was to take these two separate, disconnected ideas and combine them, so a ‘handwritten’ type built from straight lines arranged in a limited set of angles and shapes. The type was briefed and designed to work as a dramatic, impactful and characterful headline type, to use at large sizes, to make a unique statement. A headline type isn’t a signage or agate type, is not designed to be used as such, but could be is so briefed. It is odd that different agencies were employed to undertake different parts of the identity and kits applications. The logo, typeface, design guidelines, wayfaring system, pictograms, were all undertaken by separate design agencies. This separation is not a way to ensure the project’s consistency of approach. This is particularly notable in the design of the logo and typeface and the guidelines for their use, where this consistency of intent is essential. I understand the point of specialisation the employment of experts in their fields, but this implies a lack of a continued and holistic vision. An oddly short timeframe for such a project didn’t allow time for the improvement and refinement of design gained by testing in context. 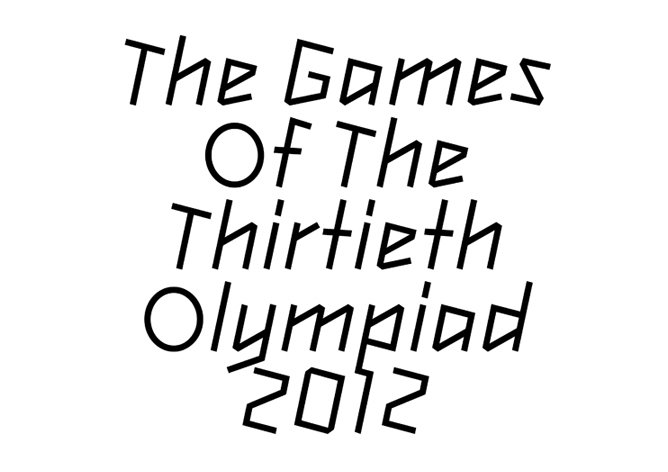 The circular lower-case o is disruptively wide in text, the upper case O echoes the olympic rings more strongly. The bottom stroke of the e feels clumsy, the a,b,d,p and q characters have a too-small counter. This was from attempting to maintain a consistency of angle of line throughout the typeface, ensure this slant expressed the characters’ italic nature, and readability of form. This is less an issue with the first-drawn and unfortunately not used lighter weight. Despite this lack of clarity what the single line weight idea does still is to give the letterform a sense of simplicity in a complex, busy graphic identity. The logo is a bold graphic shape, un-grid based and arbitrary. The typeface needed to be part of this world, be linear and graphic, not typographic, not have the formal typographic subtleties of the typefaces its been compared to, or their reference points of blackletter or cartoon. Such comparisons have missed the point and have not considered idea of the identity or the type in context, or context according to its original brief. Or they have just not liked the identity per se, so have expressed a general dislike of all aspects of the identity, not considering the inadequacies or otherwise of the type as a supporting element to the logo. They have not liked the spikiness, found it somehow overly informal or disrespectful (and London in lowercase!) or found its spikiness kebab-shop Greek and therefore inappropriate.